CareActive is focused on providing easy and seamless care for individuals with special needs. This includes clothing which is easy to put on and take off as well as easy to clean. This innovative line of products includes clothing for seniors, urinary incontinence, diabetic footwear, nursing home and healthcare apparel, bariatric clothing and even clothing for undressers. Being able to take care of a loved one or patient with ease is important. Taking care of a loved ones' needs quickly makes care much easier and frees up time to do other things. The same is true for patient care in a facility and this is Care Active's mission. Improving the ease with which we can care for individuals with special needs is Care Active's main goal. They provide products that provide utility for both the patient and the caregiver. Their products are highly functional and stylish with a the goal of preserving the dignity of the patient. We carry their utility products like the Wheelchair Poncho and the waterproof and crumbcatcher bibs. The rain poncho is perfect for individuals and patients who want or need to be outdoors during inclement weather. 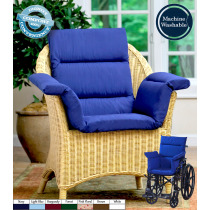 This product adds great utility because it will help protect both the patient and their chair from the elements and its simple design makes it easy to put on and off. CareActive's bibs help when the patient or user has compromised motor control or needs to be fed. A patient needs to eat and drink and these bibs can greatly help to keep their environment clean and free of crumbs. We also carry their Waterproof Mattress protector. This mattress protector attaches with anchor bands so it is easily removed from a bed and it is reversible and washable. It is an earth friendly because it keeps unnecessary waste out of landfills and budget friendly because it can withstand up to 200 washings. They can be used for incontinence protection or other spills and they are made from a flannelett laminated vinyl for added protection. 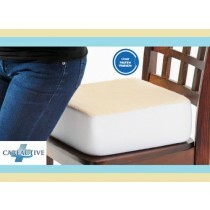 CareActive makes several types of cushions as well. They make a Coccyx wedge that will suspend the tailbone in the air if a person has lower back sensitivity or injury. The coccyx wedge is made from highly resilient materials and is available in a normal and memory foam version and fits on nearly any chair. In turn this can preserve the dignity of the patient while efficiently keeping them safe and comfortable. Vitality Medical also carries their seat risers, pressure reducing wheelchair pillows and edema socks/boots.